Google is the first major search engine to offer this privacy-protective feature. (CNET) -- Google began offering an encrypted option for Web searchers on Friday and said it planned to roll it out for all of its services eventually. People who want to use the more secure search option can type "https://www.google.com" into their browser, scrambling the connection so the words and phrases they search on, and the results that Google displays, will be protected from interception. The beta service of the secure Web search option begins in the United States on Friday and will be rolled out over the next few days to users around the world, said Murali Viswanathan, a Google search product manager. 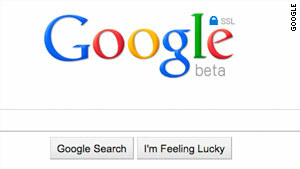 Friday's announcement makes Google the first major search engine to offer this privacy-protective feature. AOL, Yahoo, and Microsoft currently do not. "Some users will want the extra privacy and security this feature will offer," Viswanathan said in an interview with CNET. "But it's not going to be the default option, at this point. There's a lot of work to be done before we get there." The encryption protects only data in transit between an individual's browser and the Google search server. When people click on a search result and are directed to another Web site, they leave the encrypted channel. Offering encrypted connections to Google.com means that users in China and other regimes that engage in significant surveillance will -- assuming the connection is not blocked in the first place -- be able to conduct searches without governments knowing the search terms. The protected Web search service will feature a customized logo that includes an icon of a lock and "SSL" which stands for Secure Sockets Layer, the technology used to encrypt the information as it travels between an individual's computer and the Google search server. The SSL technology is typically used on banking and e-commerce Web sites. Google has always offered Gmail users the ability to use HTTPS (Hypertext Transfer Protocol Secure), which uses SSL, in the browser. The company enabled Gmail users to set it as a persistent preference in mid-2008 and offered it as an option for Google Docs, as well. It became the default for Gmail in January. People who choose the secure option on Google will only be able to get encryption for Web searches and not for other types of searches, such as Image Search and Maps, at least for now. As a result, links for those searches will not appear on the side or top of the search page when someone is in the secure search mode. The secure Web search option will slow down the initial connection a computer makes to the Google server, but it may be hardly noticeable to most people. It also means Google will have to use more processor power to handle the scrambling and unscrambling of the SSL connection, which is the biggest reason most Web sites don't offer it as an option. The service does not protect data stored on an end user's computer or at the Google server, and if someone has malware or a keylogger on the computer, Web search data and other information could be stolen or leaked. Google announced last week that it would offer encryption for Web search soon, in the wake of the news that vehicles for capturing Google Maps Street View images had mistakenly been collecting data from unsecured Wi-Fi networks for years. But Viswanathan said the timing of the encryption announcement was completely unrelated and that Google had been working on the Web search encryption offering for a few months.